Welcome! Before you begin exploring this site, we highly recommend you check out our About Us page. Happy travels! What is your favorite museum on the Parkway? 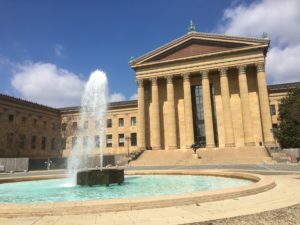 As many of us know, one of Philadelphia’s top tier attractions – the Philadelphia Museum of Art – has recently begun a massive renovation. This project, led by the controversial Canadian architect Frank Gehry, will add an additional 55,000 square feet of gallery space, making it one of the largest art museums in the world, larger than the famed Musee d’Orsay in Paris. Gehry is one of the most interesting people in the world of modern architecture. People either think he’s a genius or he ruins everything he touches, and there isn’t much middle ground. He couldn’t possibly renovate a place as beloved as this without controversy. Let’s take a look. Note: There’s a copy of the museum’s future floor plan on site. I have been unable to find a copy of this online, so there may be a few errors in this post. Much of this new space would be dedicated to the museum’s growing collection of modern and contemporary art, which has been of focus of many, if not most, of its recent exhibitions. It will also include more space for its American art collection, already among the nation’s finest. That all is good. The Art Museum has put a lot of emphasis on modern and contemporary art lately with its exhibitions, and more space to exhibit it full time is definitely a bonus. The American collection, as stated earlier, is one of the best in the nation, and having more space to display it is welcome. The Chinese galleries are being refurbished, which we can expect great things from, given how well the previous renovation of the South Asian galleries went. It’s also great that there’s a new cafeteria coming, which replaces the older one. The temporary cafeteria hasn’t been as good as the full-time cafeteria that is currently being renovated. According to the museum’s floor plan, there will be a small new section dedicated to African art, around the size of the Arms and Armor galleries. What’s interesting, and relevant once again, is the curious fact that the PMA, unlike many (if not most) large museums, does not have a collection of art of the Ancient World (aside from Asia) or Africa. The reason for this is both understandable, and an interesting piece of trivia; back in the day, they made a deal with the Penn Museum saying that the PMA would collect European and American art, while the Penn Museum did the rest of the world, and they’d both collect Asian art. Even though the PMA has overshadowed Penn in fame and popularity, the deal persists to this day. However, the Penn Museum itself is undertaking a renovation of its own, so we’ll see what happens. Still it is interesting to think about what would have happened if the PMA hadn’t made that deal and collected everything. Would they still have their current building? Would they have built bigger? Where would it be? Back on subject, one of the best parts is the reopening of the North Entrance, and the long, vaulted corridor connecting it to the rest of the museum. That’s great, opening up a beautiful space and providing a new entrance. There will be a new space called the Forum, which will be under the Great Stair Hall, and connect to the new basement galleries. The opening of the Forum will be interesting, as it will be the gateway to a whole new section of the museum, part of the addition, rather than renovation. The staircase connecting it to the existing parts of the building is also rather interesting, in terms of design. There’s going to be a new education center, which should be good for the local programs. In addition, there’s going to be a new auditorium. It’s also notable that the Dorrance Galleries, home of the largest special exhibits, will close, and become a new space for American art. The Philadelphia Museum of Art, as it stands now, is one of very few museums to have its major temporary exhibits right by the main entrance. The largest temporary exhibits will be in the new space under the existing space. But the thing that has gathered most people’s attention is the massive window placed on the museum’s front stairs, also known as the Rocky Stairs, which are themselves as much a landmark at the museum itself. This has gained the ire of many, who see it as removing one of Philly’s icons. The stairs were elevated to that status by the 1976 boxing film Rocky. In one of cinema’s most famous scenes, Rocky Balboa ends his extensive training scene by triumphantly charging up those stairs and leaping victoriously. Many have suggested that the hole in the stairs is the result of the museum trying to distance itself from Rocky. Whether the museum likes it or not, that scene will always be what they’re known for. 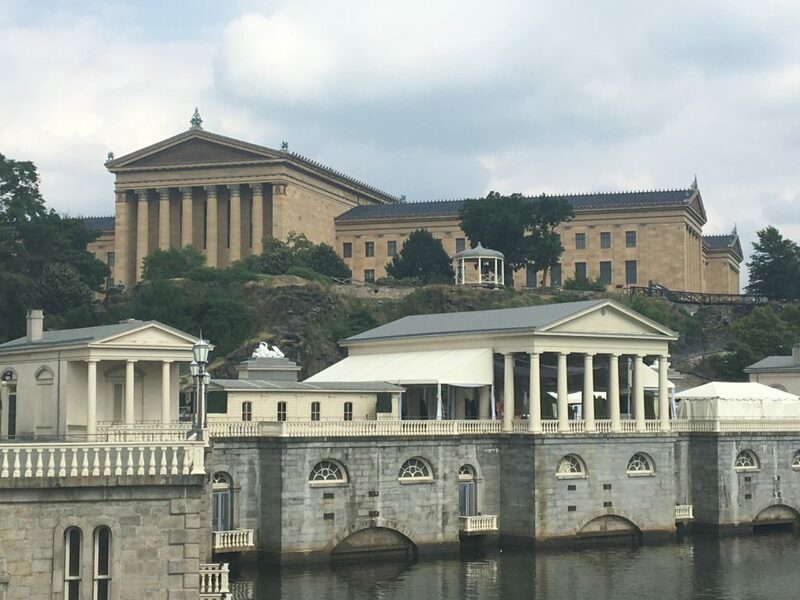 No matter what, the Philadelphia Museum of Art will always be the building from Rocky. And that’s not necessarily a bad thing, as there are other museums known for their cinematic roles. It’s hard to not associate New York’s American Museum of Natural History with Night at the Museum, and many people associate the Art Institute of Chicago with Ferris Bueller’s Day Off. Case in point, when I went to the American Museum of Natural History, people were addressing the Easter Island Head (technically called a Maoi) as “Gum-Gum,” the name of a character from Night at the Museum. And regardless of what they do to the stairs, there will always be people running up them. But the window itself has issues other than Rocky. Many have criticized it as ugly, and out of place given the rest of the building’s architecture. That’s valid, but that’s also a Gehry specialty. Perhaps more vexing is that the view from this window would be quite limited – perhaps only to the tops of the two Comcast towers, which can already be seen throughout the region. Worst of all, there are events held on the stairs. Every year, performances at the Thanksgiving Parade are held on the stairs. Sometimes, the parade concludes with Santa Claus running up the stairs. The Eagles concluded the Super Bowl parade on the stairs. With the 76ers, Phillies, and Flyers showing a lot of young talent, another championship parade may very well be in Philly’s near future. Heck, the Eagles could do it again. But, all this aside, the Rocky stairs are kind of a touristy – and every city has a touristy attraction. In New York, you can buy any nick nack imaginable where the boats to the Statue of Liberty leave. I’ve heard that there are guys in gladiator costumes that scam tourists at the Roman Coliseum. No matter what, you will always have those people, and you’ll always have that one place. And in Philly, they go to Rocky. That’s all there is to it. Personally, there are some other minor things I would like to see added in the Art Museum renovation. I think that if they’re moving the modern stuff to the basement, they could expand the Impressionist section, given how immensely popular they are. Second, since they added music to the India section, they could add some traditional Chinese music to the new China gallery, and perhaps Gregorian chants to the cloister. There’s quite a bit to look forward to in the Art Museum’s future. New galleries, new entrances, new dining options, entirely new sections. But like any good Frank Gehry work, it’s not without its controversy.